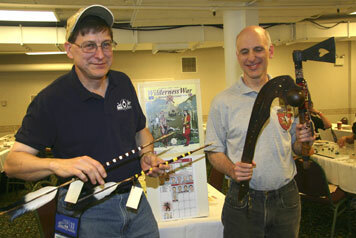 Ron Fedin and Keith Wixson display the special ceremonial period weapon replicas Keith provides as extra prizes. Gary Phillips and Bruce Monnin check their hands to see what fate has in store for them in the preliminaries. 2003 Champion Paul Gaberson became the first double winner in the event, breaking a string of five different champs in as many years. Gaberson went undefeated in beating Michael Ussery, Bruce Wigdor, Bruce Monnin and Randy MacInnis in the preliminary rounds, George Young in the semi-finals and 2004 Champ James ("The Master") Pei in the championship game. MacInnis was the other semi-finalist, surviving his loss to Gaberson in Round 4 by gaining tiebreakers in upset victories over #2 Seed Tom Drueding in Round 2 and #1 Seed/defending Champ Keith Wixson in Round 3. * Young was the only 2006 laurelist to make it into the top six this year. A complete or near complete turnover of the laurelists in this tournament every year has become something of a tradition. 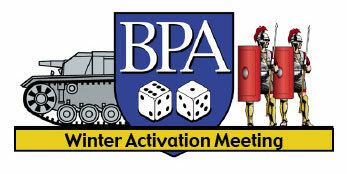 * Attendance was up 17%, increasing to 35 from 30. There were six new players. Since attendance for the other CDGs appeared to be generally down, the future of the event in this timeslot appears to be bright. * There are preliminary plans to add a quarterfinal round next year. * MacInnis won the Biggest Upset Award for his win over the defending champ. * The Top New Player Award went to Grant LaDue who went 3-1, losing only a close game to the GM. * After last year's relatively good results for the Brits, the French came back strong winning 61% of the 46 games played (as compared to 52% in 2006). The average bid to play the French crept up to 1.02 VPs from .93 VPs last year (it was 1.11 VPs in 2005). There were 23 bids of 1 VP to play the French and 12 bids of 2 VPs. The French record in the 2 VP bid games was seven wins and five losses and in the 1 VP bid games it was 14 wins to nine losses. In the eleven games without bidding there were seven French wins. * Perhaps the most interesting story this year was that Gaberson is really the only player to have embraced a bid of 2 VPs. He was involved in half of the 2 VP bid games, making that bid in all of his games and accounting for five of the seven French wins in the games with that bid (in his other win he played the Brits when his opponent also bid 2 and won the rolloff). Something tells me that this might start a trend! * For the third year in a row the eventual winner had to defeat The Master and that game went down to the final card and die roll! * Prizes: In addition to the plaques, the Champ received a Missouri River War Hatchet and the runner up received a Ball Head Warclub. The losing semi-finalists each received Ceremonial Medicine Arrows. A book, a DVD and some period 54mm toy soldiers were also awarded. I don't have a formal AAR this year as the game was played very late at night and the players and I were too exhausted to remember the game that clearly. As mentioned above, the championship game of Gaberson (French) against Pei (British) went down to the final card and die roll. The final turn saw a large British army under Wolfe driving up the Champlain Valley towards Montreal against the much weaker main French army under Montcalm, while another British army secured Ohio Forks which had already been abandoned by the French. Quiberon had been played so the Brits had more cards, but towards the end of the turn Paul had skillfully maneuvered Montcalm between Wolfe and the British supply line and it became apparent that Montreal would not fall. There was no margin for error, however, as VPs only stood at FR1 once the Forks were secured; James needed 2 VPs to win as Paul ran out of cards. The first point was easy enough because Paul just gave it away. As Wolfe moved against Montcalm to force a battle, a small French force with Regulars under Drucour inexplicably attempted to intercept to slow the Brits down. The interception failed, but James realized that Paul was willing to give up a VP so he bore down on Drucour and wiped his force out. VPs were therefore at zero, which is a French victory if it ends that way, as James was down to his final card. He used it to activate Wolfe and Rogers' Rangers to raid Sorel with a 5/6 chance at success and a VP to put him over the top. This is a standard British play late in close games but Paul had obviously forgotten about it with fatigue setting in. But James rolled a "1" and the raid failed miserably. Perhaps the guy hasn't sold his soul to the devil after all. What I want to take away from the experience is the memory of struggling with a man who is undoubtedly the finest player of card driven war games on the planet, taking him to the last card play where I had a 1 in 6 chance of winning and being rewarded with the victory. What I would like to forget is the fact that with three cards left to play I had about a 90% chance of winning and I managed to play that down to the 17% chance I ended up with. If my mind had been a little clearer I think I would have known that it was going to be my night. James is often accused of being able to control the die with some form of Zen mind control but his usual mastery was definitely missing in our game. I'll relate one sequence where a lot of operation cards were burned which is always to the advantage of the French player. During the first turn after Montcalm was able to take Ft. William Henry, James hit me with Vaudreuil Interferes and off Monty went to inspect Louisbourg. James had already played a British Regulars reinforcement card so Murray and 18 strength points were waiting at Halifax. This was the first big decision of the game for me: can I afford to leave Montcalm there? The chance of getting Montcalm trapped for good was 39%. I decided to take a chance and played Small Pox on Murray's army and I was successful in getting two hits so they were down to 16 strength points and Monty's odds improved to 22%. James immediately sent the Royal Americans battalion from Philadelphia to Halifax to make up the loss. At this point I decided I couldn't risk losing Montcalm in early 1757 so I shipped him back to Quebec and moved Villiers to Quebec just in case it was all a bluff. Of course it wasn't as Murray immediately made the amphibious move and I withdrew the garrison inside for the siege. No siege rolls were made in what was left of early 1757 because James was out of cards (he had used the Amphib card and had also played Massacre when Montcalm took the fort). In Late 1757 I got Bastions Repaired so I was looking forward to stretching out the siege. There were no British reinforcements so Murray was going to be doing all of the work. The first siege roll was successful and I immediately removed the siege point. The next attempt failed. Two more cards were required to get siege level 2 and the first assault. The die rolls were something like 4 for me and 3 for James. I was on the 9-12 column and he was on the 13-16 column so with losses 3 to 3 the assault failed. Perhaps this was the harbinger of things to come for James and the evil die. Other things had been going on and we both needed to get units into winter quarters so cards were running out fast. When he eventually got around to making the next assault attempt I don't think he had many cards left. This time I was on the 6-8 column and he was still on 13-16. Again he rolled low and I rolled high so again we both got three hits. This eliminated all of my units but in a siege it isn't a win. He was now out of cards and as I recall needed to use the Quiberon card to move Loudoun and the main army in New York into winter quarters. Murray's army suffered attrition at Louisbourg. That sequence was a lot of fun for me and not so much for James I suspect. Of course Louisbourg fell in early 1758 and Quiberon managed to jump back into the British hand almost immediately so I suffered with only seven cards for the last few turns. But in the end James ran out of cards and had to attempt that last card play raid with Wolfe and the Rangers. If it hadn't taken six or seven cards to reduce Louisbourg perhaps the final result would have been different. Of course if I could count to two at 2:00 a.m. I wouldn't have thrown away a VP I couldn't really afford to lose and I would have won even if the final raid had been successful. Fortunately for me, fate decided to reward a fool and I'm not too proud to take it and run. 2008 WBC Champ James "The Master" Pei bested a field of 62 players to win the 2007-2008 Wilderness War PBeM Tournament, a six round Swiss-Elimination format competition which began in early 2007 and took approximately 18 months to complete. Pei defeated George Young in the Final to win his second PBEM crown. 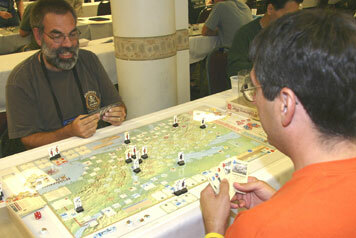 Pei defeated Henry Russell, Jim Winslow, Kevin Worth, Grant LaDue and Ron Fedin in his march to the championship game. Pei, Young and Fedin went undefeated in the four Swiss rounds, while Adam Deverell advanced to the semi-finals with one Swiss loss by earning the necessary tiebreakers in wins over Jim Lawler, Tom Thornsen and 2007 WBC Champ Paul Gaberson. Deverell's loss was to Fedin in Round 4. Young defeated Alan Poulter, Patrick Duffy, Bill Edwards, Rob Winslow and Deverell.